If you read my previous post, you know I've been on a quest to find healthier body products for my kids and me (my husband could put vegetable oil on his face and his skin wouldn't react. Plus, I doubt he'll wear anything smelling of lavender anytime soon). Natural deodorant is one of the trickiest things to change over to. I've been a Secret Soft Solid Powder Fresh Antiperspirant/Deodorant girl for as long as I can remember. It does the job, and I am a serious sweat-er, no matter how in (or out of) shape I am. 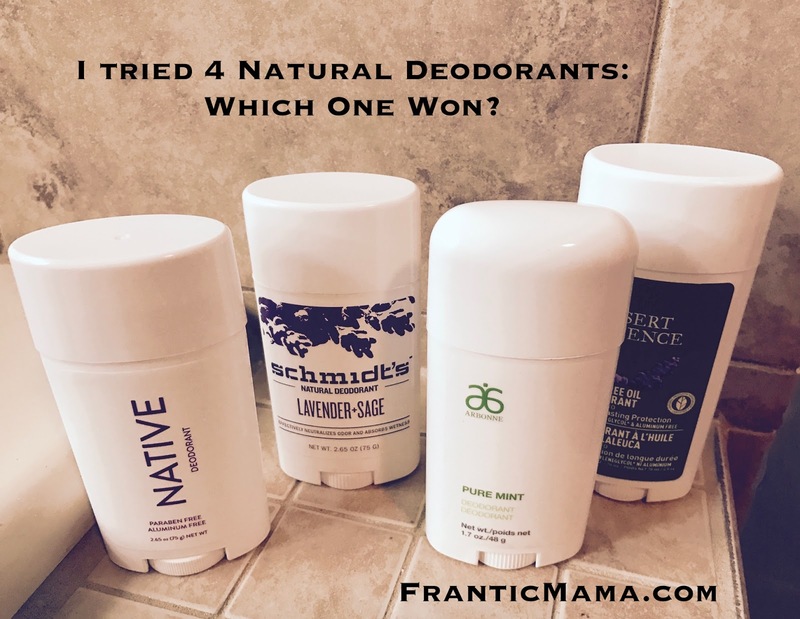 My priorities for a new brand were twofold: it can't have aluminum (which eliminates any type of antiperspirant) or Parabens (known endocrine-disrupters and possible carcinogens). All four of the following meet those two criteria, and they all had their plus sides, but I do have one favorite. Pros: It smells really good and has a soft solid feel which I prefer to a wet gel. It's a decent price, available at Target. Cons: I definitely had to reapply throughout the day in order to smell fresh. Still, if you aren't a super-sweaty person, this might be a good bet for you. Pros: Again, it smells nice and light and was available and inexpensive at the local natural foods store. Cons: It's more of a gel, which isn't my favorite. I had to reapply often (yikes!) in order to avoid smelling like a teenage boy! Not a good one for me overall. Pros: Refreshing unisex mint scent. Clean ingredients and packaging. Works pretty well, though you might need to reapply if you sweat a lot or workout. Cons: It's the most expensive of the bunch by far and you have to order through a consultant. It's also a gel, which I don't love. Pros: My friend who had recently converted to aluminum-free products said this was her favorite after trying about 5 brands. I was 0 for 3, so I quickly ordered some. It smells really nice like the Schmidt's, and it is that same powdery feel that I like. *(Shout-out to Amanda for her recommendation!). Most importantly, Native works the best! Cons: You have to order it online as far as I know, and it costs more than, say, Schmidt's, Tom's of Maine (which still often has aluminum in it! ), or Secret, of course, but with free shipping it came out to about $10-- worth it for being un-smelly and mostly chemical-free! It is like a magic potion. You simply can't believe it works but it does. What have you tried and liked? I'd love to hear your thoughts and recommendations when it comes to going more natural. What works? What doesn't? What are you avoiding, and what are you embracing? My next mission: To round up my favorite mineral-based sunscreens! P.S. This is a completely unsponsored post. I purchased all of the products myself, and I am not participating in any kind of advertising campaign for any of the brands I note. Though if you want to try Native and earn us free travel sizes, feel free to use my referral link :). Find more frantic fun on Facebook and Instagram! Is Au Natural always the best option?